Tucked away in some of the most beautiful corners of York Region are hidden treasures for the art lover to discover. York Region is not only home to a number of world-renowned art galleries, but it is also the place where many artists and artisans live and work. Soothe your soul with the impressive permanent Canadian art installation at the McMichael gallery in Kleinburg. Built of hand-hewn logs and fieldstone, the McMichael Canadian Art Collection boasts 6,000 pieces of art. Floor-to-ceiling windows in its galleries allow you to admire works by the Group of Seven and aboriginal artists, interspersed with views of the surrounding forests and countryside. Lectures, workshops and trails enhance the cultural and scenic experience. All of York Region’s municipalities are proud to support local arts and culture and encourage art festivals and shows throughout the year. Come and visit our artists in their homes and studios by joining a tour. 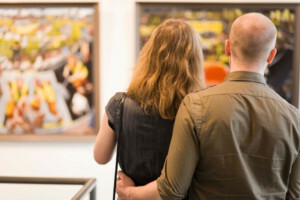 A diverse selection of media is represented including acrylic, watercolour, encaustic, oil, pastels, pottery, sculpture, jewelry and wood-block printing. There is something for everyone.